→13 Unbeatable Recipes for Shrimp and Number 6 Will Blow Your Mind! When hosting a dinner party, or just having guests over for a nice get-together, shrimp is probably going to be on your menu. Just having shrimp can be boring and no fun at all, so why not have a look at my list? From the basics to a unique sides, dressings, and sauces, we’ve got you covered, and you can impress your guests with all the fancy sides that they may find interesting and delicious! 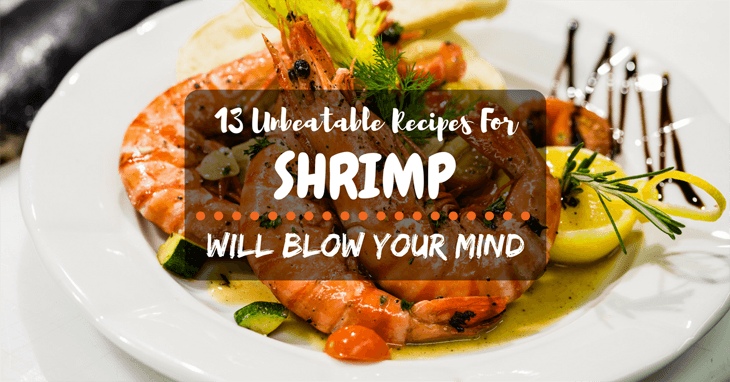 Whether you serve shrimp as a main dish, an appetizer, or a side, I’ve got all the delicious recipes and idea you need to make your food a success with your guests! Remember, shrimp can be boiled, grilled, baked, and even eaten raw if it’s been safely prepared. No matter how you eat it, dressing it up is what they’ll remember! 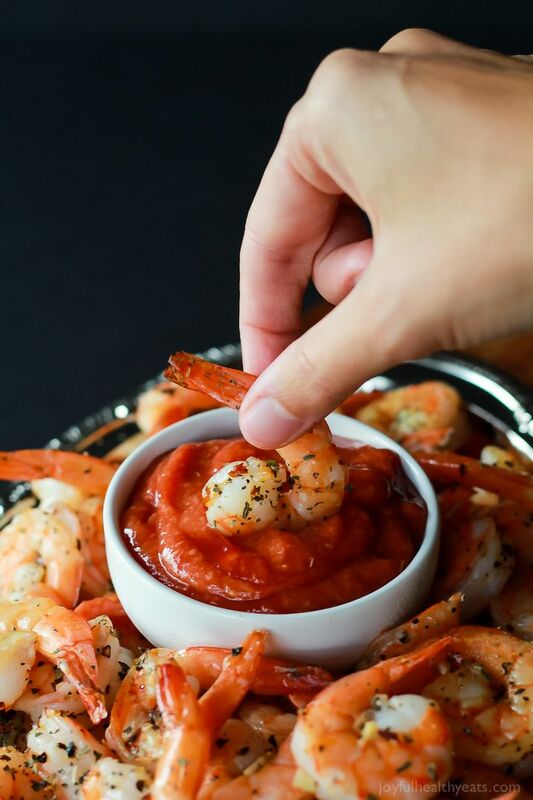 Cocktail sauce is the ultimate sauce to shrimp. It brings out the natural seafood flavor while complimenting it. This sauce can be changed to fit your style of cooking, your flavor palette, and even to fit a theme such as Mexican, Asian, or even Southern. There are so many recipes for cocktail sauce, which maybe you’re not sure what route to choose. You can never go wrong with the classic cocktail sauce. Cheese grits is a classic to serve with shrimp. This is a combination you can find all along the southern parts of the United States. The cheese, the grits, the shrimp; it all works together to create a unique and extraordinary flavor combination. The texture the grits have mixed with the smooth, creamy cheese, and the salty ocean flavor of the shrimp, make this a must-have. This is a simple recipe and doesn’t take too long at all. ​2. Boil the 3 cups of water and then add the grits. Reduce to low heat and cover. Cook for 5 to 7 minutes, stirring occasionally until thickened. Remove from heat. You might be thinking to yourself: does shrimp work with mushrooms? The answer is yes! Mushrooms have an earthy tone to them, while shrimp is fresh; the two work together. The risotto provides a unique texture bonus along with a creaminess. 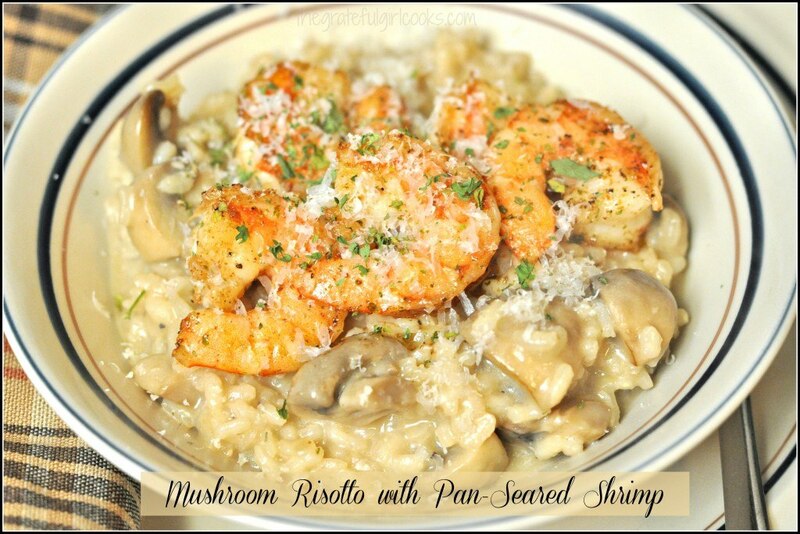 This mushroom risotto will be a great side served with shrimp. Make sure to use high-quality ingredients, and cook the risotto as required. You don’t want to end up with a mushy mess, or under-cooked pasta. Serve the shrimp on the side with some herbed seasoning, and voila! A great combo unfolds for your guests! This is a fresh option that works well with cold shrimp. The kale has a bitter, peppery flavor while the lemon has a fresh acidic element, and the garlic adds a bit of spiciness. Together this salad works very well with undressed, cold shrimp. 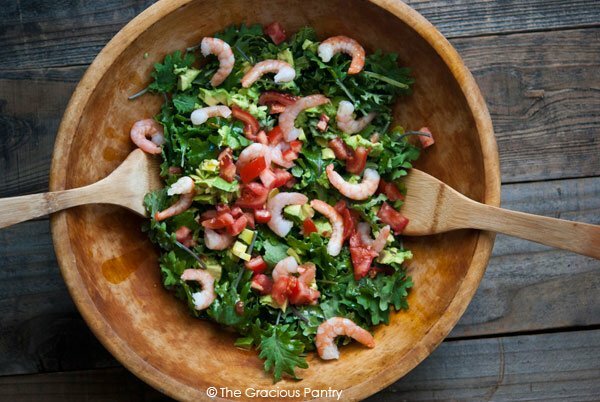 A lemon-garlic kale salad is a perfect complement for shrimp. Maybe lemon-garlic isn’t your thing, and you prefer something a little different. Absolutely! I’d recommend a kale salad with tomatoes, sunflower seeds, and cranberries for a fresh alternative. The tomatoes provide just the right amount of acid, while the sunflower seeds add a nutty crunch, and the cranberries give a hint of sweetness that makes the shrimp pop! Another ways, you can choose this recipe Shrimp Sweet Pea Salad Boats from SugarLoveSpices.com, it's so amazing! This coleslaw is fun, bright, and beautiful to serve with shrimp! It has red cabbage, green onions, green cabbage, carrots, and a whole lot of seasoning to bring this simple slaw together. It’s flavorful and will add some color to your grilled shrimp. This slaw is delicious and nutritious, and your guests will be dying to get your recipe! The colors in this Mardi Gras slaw show off the colors of actual Mardi Gras! This is festive and unique, and will make your food stand out from the rest! Honey Balsamic foam might seem weird to you, in fact it’s probably weird to most people. Nowadays, molecular gastronomy isn’t all that rare of a find. Molecular gastronomy is a blend of physics, chemistry, and cooking! Molecular gastronomy is showing up in restaurants all over the world, from beaded balsamic pearls, spheres of food, and even transparent pasta. And instruction is very simple, combine with an immersion blender and froth. Spoon over shrimp. After that you can enjoy it! This is another classic. Guacamole is an easy side to make just using avocados and salt. Perfect ever time. However, you can also spruce up your guacamole by adding in lime juice, cilantro, tomatoes, onions, and even chilies. The possibilities are endless when making guacamole. Add whatever you like, and it’ll be a real winner. I always go back to my favorite guacamole recipe when making it, and the taste it gives with shrimp makes me feel like I’m back on the beach in Mexico! This is a dipping sauce to enjoy with grilled or boiled shrimp. This sauce is easy to make, store and can be used as a marinade. 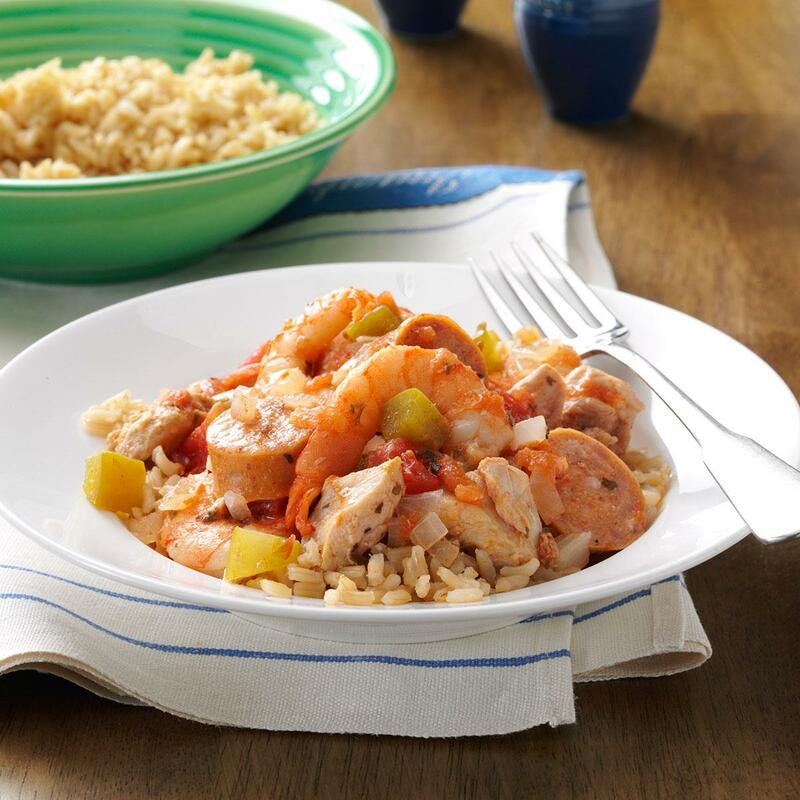 It’s versatile for any ingredient, including pork, beef, and chicken, but today we’re pairing it with shrimp! If you think it might be too tangy for shrimp on its own, divided the hoisin into two bowls. Keep one as just hoisin sauce, and to the other add mayonnaise. That’s right. Now you have an original hoisin sauce and a mayonnaise-hoisin mix for a special treat. Hoisin sauce is easy to make, using only brown sugar, water, black bean sauce, soy sauce, rice vinegar, prunes, sesame oil, Chinese five spice, and some added heat if you choose. Blend it all together and store up to a week. Easy peasy, but looks and tastes like a million bucks! Pesto, I’m sure, makes everything delicious. It’s one of those things that you hear people putting on, in, and dipping into all the time. It’s very easy to make, taking about 10 minutes at most to make, and the ingredients are simple. Pesto is great in pasta’s, as salad dressings, mixed with butter and served on steak, but have you ever tried dipping grilled shrimp into pesto? No? You ‘re missing out. Seriously. 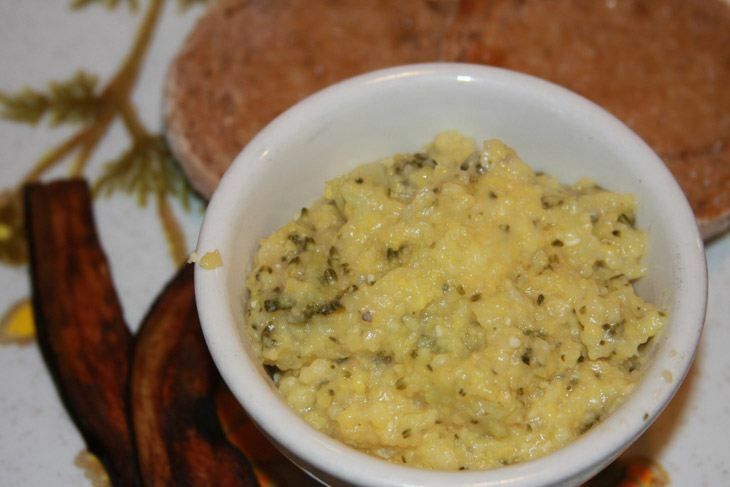 This pesto is addicting as a shrimp dip. You need this in your life, and you need to share it with your friends! This is, of course, a classic. Barbecue sauce is served with everything nowadays. It’s a go-to sauce that you can find in everyone’s pantry or refrigerator. It’s just there, so why not spruce it up a little? Make your own! I don’t have the time for that! You do! 1. Sauté the onion in oil, in a saucepan, until tender. Add garlic and cook for 1 minute. Add in chili powder, cayenne, and black pepper and cook for 1 minute. Artichoke dip is known for going alongside baked bread, crispy bruschetta’s, and even dipping sweet potato fries in, but this is a nice addition to shrimp. Shrimp and artichokes have a great flavor combination that create a delicious meal. Artichokes taste like a savory nut. They have a nutty flavor, but are also savory and a little starchy; a little like a potato. Artichoke dip is a great appetizer pairing with shrimp. Your guests won’t believe how well the pair works, but they will be delighted when the eat the last bite; but just in case, you should probably make two batches. This is a great idea for the main course. Boiled or grilled shrimp laid across a beautiful lemon garlic linguine is amazing. The fresh lemon makes the shrimp seem fresh, while the garlic adds a spicy undertone. Pasta pairs perfectly with shrimp. It’s a classic and a no-brainer that will make a meal complete. Just make sure you have a crisp white wine to go with this meal and a slice of cheesecake for dessert. Wouldn’t want to mess up any pairings. Orzo is such a unique pasta. It’s becoming more and more popular with home cooks because of how easy it is to work with, how fast it cooks up, and how filling it is. This pasta looks just like rice, but it’s pasta. It’s cool to work with and can be a great conversation with your guests. Did you know Orzo is pasta? Now you do! Maybe my conversation was a bit…lame. Moving on! Orzo is delicious and paired with a creamy Parmesan sauce and shrimp; it’s magnificent and mouthwatering. This Parmesan Orzo is a winner for any shrimp dinner! There you have it! Our top 13 list of what goes with shrimp. If you have any suggestions on what you like to cook with shrimp, how you like to eat it, or things you think we should add to our list, tell me! I invite you to try these recipes and tell me what you think. Did you enjoy them? Do you prefer your shrimp spicy or mild? What’d you think of the foam? That was weird, right? I tried it, and to be honest… it was pretty dang good! Here’s what I’ll leave you with, come out of your comfort zone and try new things. You may not like all of them, but I promise you might just find your new favorite!